Not Time To 'See The Winter Wonderland': N.C. Governor Says To Stay Off Roads Up to a foot of snow is expected to fall across the southern Appalachians and nearby foothills in North Carolina and Virginia through Sunday night. 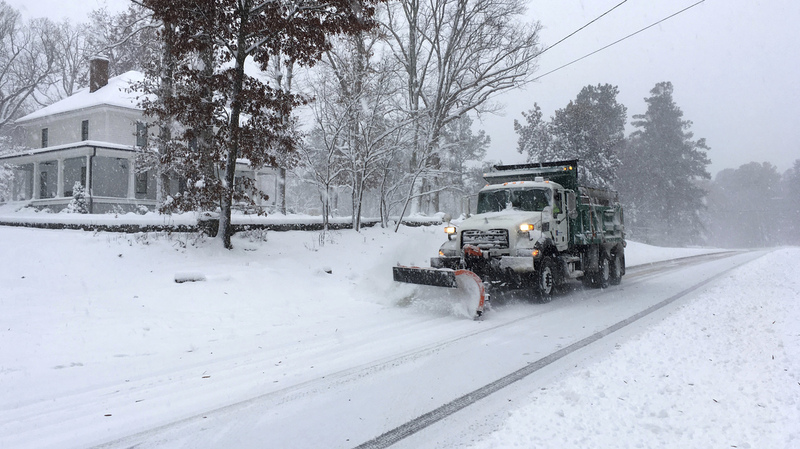 A snow plow moves on a snowy Durham, N.C., street on Sunday. Weather Prediction Center forecaster David Roth told NPR this could be a "historic storm" for southwest Virginia and western North Carolina. 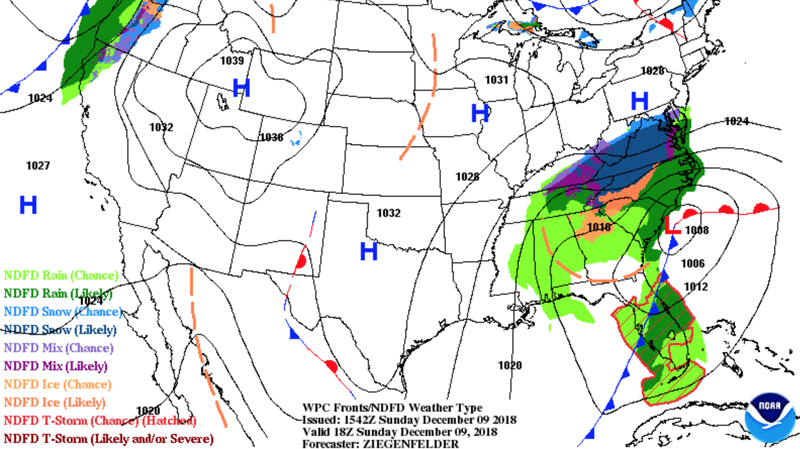 Up to a foot of snow — and possibly more — is expected to fall through Sunday night across the southern Appalachians and nearby foothills in North Carolina and Virginia. "Some places might get what the equivalent of a year of snowfall is for that area," David Roth, a forecaster with the Weather Prediction Center, told NPR. "I would think this will end up being a historic storm for southwest Virginia and western North Carolina." The National Weather Service has issued winter storm warnings for areas from northeast Georgia to southern Virginia. A mix of wet snow, sleet and rain are predicted to hit southern Virginia and the coastal plain of the Carolinas, which is still recovering from Hurricane Florence. Churches across the region have canceled Sunday services, and many schools are planning to shutter their doors on Monday. The heaviest snow is expected to fall in western North Carolina and southwestern Virginia. North Carolina Gov. Roy Cooper declared a state of emergency on Friday. On Saturday, the governor urged people not to risk travel during the snowstorm, which he reminded residents isn't the same thing as "snow fall." "This weekend isn't the time to head out to see the winter wonderland. Stay safe where you are," Cooper said. Virginia Gov. Ralph Northam followed suit, declaring a state of emergency on Saturday. "Virginians should take all necessary precautions to ensure they are prepared for winter weather storm impacts," Northam said. Being prepared means having up to three days worth of food on hand and an emergency kit in your car, said North Carolina's emergency management officials on Saturday. It won't be easy for people to travel during the storm — by road, train or air. Cooper warned that North Carolinians who brave the roads could make it harder for first responders and road crews to do their jobs, which includes keeping roads ice-free. "Each night, any snow that melts during the day. ... it could refreeze," forecaster David Roth told NPR. "You're going to end up with black ice on the roads." As of Saturday morning, the governor's office said that road crews had spread more than 1 million gallons of brine solution on the state's roads to keep them from getting icy. By Sunday afternoon, authorities had responded to hundreds of traffic accidents in the storm-struck region. Virginia State Police said in a statement that they had encountered more than 60 crashes across the state. North Carolina Gov. Cooper said at a press conference Sunday that the State Highway Patrol had responded to more than 500 crashes and at least 1,000 calls for service. Flights to and from cities in North Carolina and Virginia have been impacted, too, according to travel advisories from multiple major airlines, including Delta, Southwest, United and American. Flights in Tennessee and South Carolina have also been affected. FlightAware, a website that tracks flights, reported more than 1,000 cancellations of flights into and out of Charlotte Douglas International Airport on Sunday morning. And, on Saturday, Amtrak announced it would be canceling trains and changing services through Tuesday. As heavy snow and ice weigh down branches and cause trees to fall, power lines could fall, too, causing power outages. One of the country's largest electric companies, Duke Energy, announced on Saturday that the storm could bring more than 500,000 power outages in the Carolinas. According to a website that tracks live power outages, more than 200,000 people in North Carolina were without power as of Sunday afternoon. More than 90,000 were without power in South Carolina.